When I was a kid and someone brought out a carrot cake at a birthday party or celebration, I would seriously mope. No offense if carrot cake is your favorite…but who wants vegetable-flavored cake? Not even cream cheese frosting can redeem that. Cake should be rich and sweet with a light but even crumb. There should be no carrots. But I read recently that carrots are the only vegetable in season where I live during the month of October. 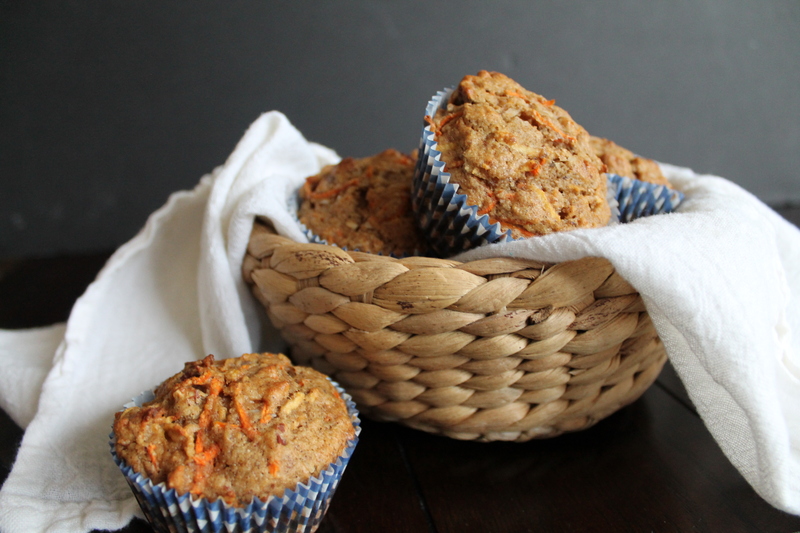 So I made you some morning glory muffins—which, of course, is what we call carrot cake when we eat it for breakfast, which we should all agree is a much better time to eat “cake” made of carrots! 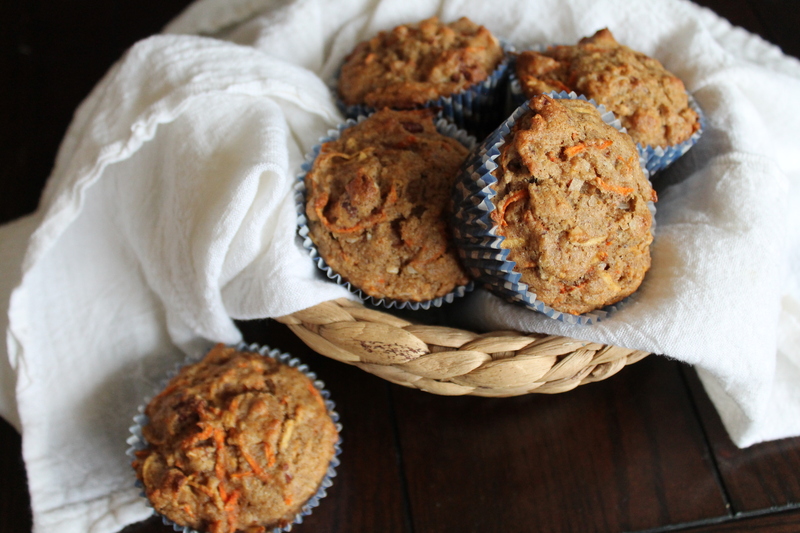 I love the idea of a healthy muffin, and these muffins really are pretty glorious: they have no refined sugar, they use whole grain flour, and they are full of shredded fresh carrots and apples, as well as coconut and pecans! My son begs for these muffins, and I love to indulge him! Hiding a vegetable in plain sight while my son scarfs it down? Yes please. For these muffins, I consulted my favorite morning-glory-muffin lover, who assured me that it was perfectly fine to skip the classic crushed pineapple (ew!!!) and raisins (ew again! 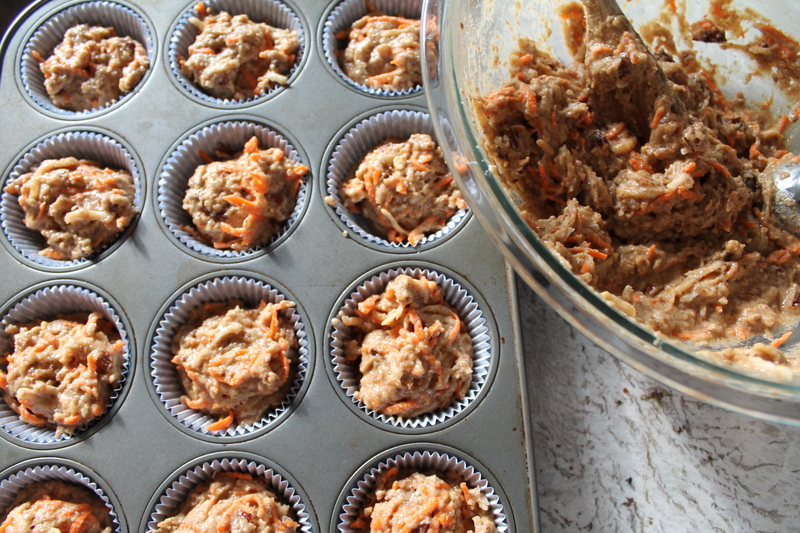 ), as long as the muffins were spiced, carroty, and sweet. So here we go! The major disadvantage of these muffins is that there are a zillion ingredients. But on the other side of the scale, this recipe makes a large amount, and they freeze beautifully! Whisk together all the dry ingredients: wheat flour, salt, baking powder and baking soda, spices, and ground flax seeds. In a separate, large bowl, whisk the eggs with maple syrup, melted coconut oil, applesauce, and vanilla. Stir the liquid into the dry ingredients. Don’t try to get it completely smooth; muffins are meant to have a slightly uneven texture, and they will become tough and chewy if you try to beat the batter into smooth submission. Grate the carrots and apple. If you have a food processor use it. You will be so glad you didn’t have to spend the extra time trying not to grate your fingers with the carrots. I highly recommend you measure the shredded amounts rather than guessing from the whole produce! Every carrot and apple will be a different size, and these muffins don’t want to be overwhelmed. 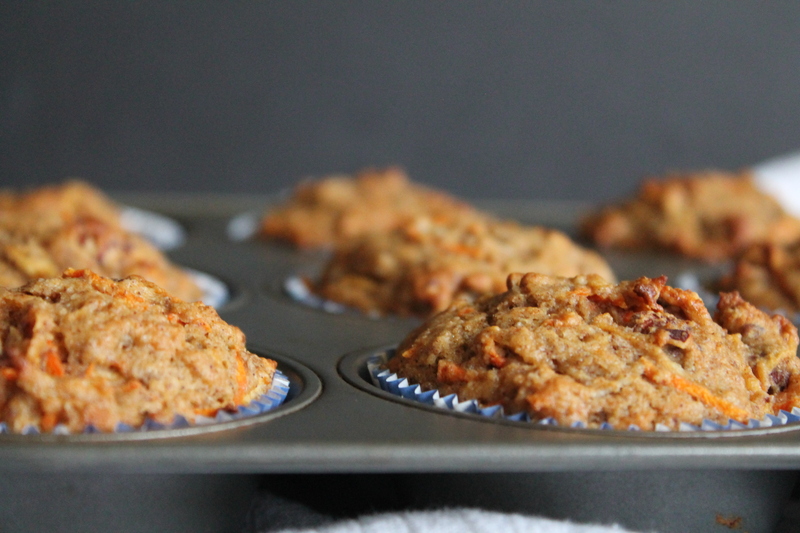 Too much carrot and apple will make some very chunky, vegetable-y muffins. 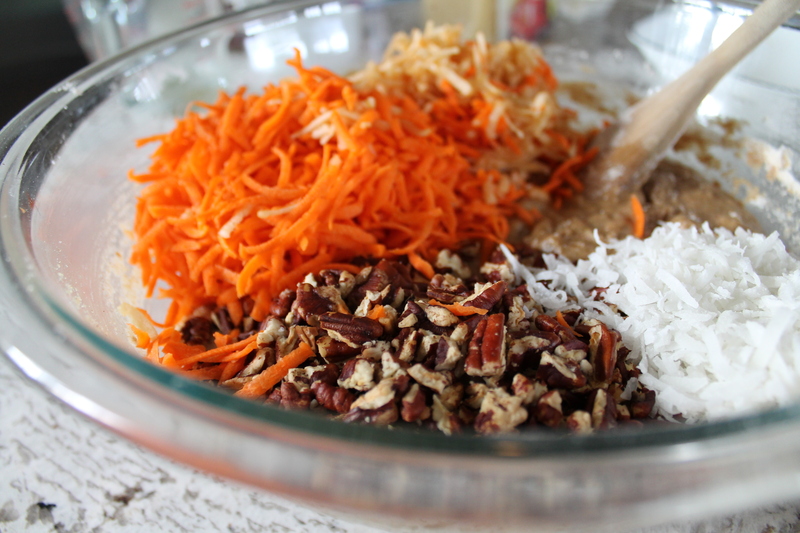 Stir the shredded carrot and apple, along with shredded coconut and broken toasted pecans into the batter. Go gently, and stir only until everything is barely mixed in. 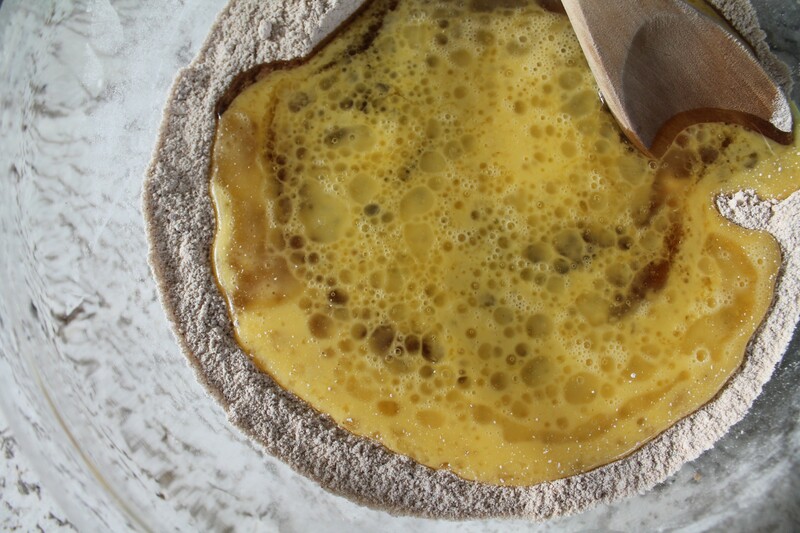 Scoop the batter into a paper-lined muffin tray, filling the liners about three-quarters full. I like to make a few mini muffins alongside the normal-size ones, because Jake thinks mini muffins are the best. As I said, this recipe will make a lot! I can get 16–18 normal-size muffins. Bake for 20 minutes at 375°. Check to see whether the muffins are done by pressing the tops lightly. If they spring back, set them aside to cool! If they don’t, then give them another 2–5 minutes in the oven. Nothing is worse than an underbaked carrot cake, trust me. I love these slathered with butter. If you’re into that sort of thing. I’m just saying. Preheat oven to 375°. Line a muffin tin with paper liners. Whisk together flour, baking powder, baking soda, spices, salt, and flax. In a separate bowl, combine the eggs, maple syrup, coconut oil, applesauce, and vanilla. Stir the wet ingredients into the dry ingredients until barely combined. 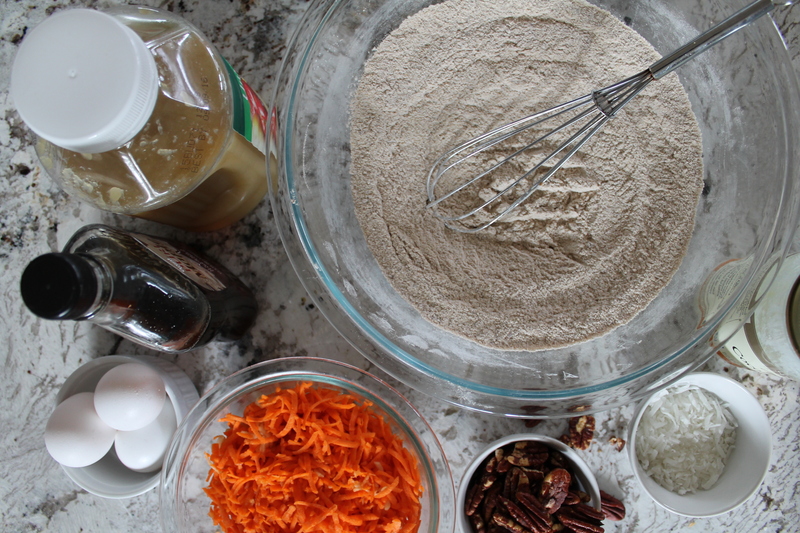 Fold in the carrots, apple, pecans, and coconut. Scoop the batter into the prepared muffin tin, about ¾ full. Bake for 20–25 minutes, or until set and golden on top.